It was very easy to forget the sheer amount of trouble that Bii had caused, sometimes, when Mhumhi looked at him. A diminutive little fox who was a fraction of his weight, on three legs, no less. If he search deep enough inside himself he could even find an instinct that suggested that Bii, with his small size and hobbling movements, was nothing more than an opportunity for meat. That part of himself, however, was hard to find; he had been raised among foxes, after all. He still wondered what Bii’s motivation was this time, however, while he followed the fox across the dump, jumping over the piles, constricting his pace so that the limping fox could keep up. Bii frequently stopped and dug at the garbage, releasing some tiny insect or another buzzing into the air so he could snap it down. Mhumhi found this statement oddly fitting, considering what he had been thinking a moment ago. “Are you saying that’s our fault?” snapped Mhumhi. They had traveled far to get here, possibly over a mile- it was hard to tell on the uneven ground. And now Mhumhi looked and saw that the tire Bii was standing on was just the beginning of a virtual labyrinth of the things, some standing in tall stacks, others standing up on their sides, their gaping openings like a giant’s nostrils. There were other things, too- large black and white plastic bags, stuffed full and ballooning outwards amongst the tires. Some of them seemed to have been ripped open, their cloth contents spilling out and scattered in the reddish dirt visible between the tires. Bii flashed him a grin, his whiskers wrinkling upwards, and then began picking his way carefully through the tires, hopping from one to the next. Mhumhi did his best to follow him- it was harder to navigate through with his longer legs. Bii stopped again in front of a tire standing on its side, and Mhumhi peered through it. There were more behind it, tilting gradually, so that they formed a dark tunnel angling downwards. He heard a soft noise, and his ears pricked forward, and he stuck his head inside, straining his eyes in the darkness. Something exploded out of the tunnel and hit him in the throat. Mhumhi twisted and fell backwards, thrusting up with all four paws, dragging the heavy body away. The teeth twisted in his flesh, the hot breath and warm drool heating his skin, and he gave a choking gasp and managed to jerk himself away. The other dog attacked again immediately, bearing down in him, so that he was forced to use his own teeth, and he caught her by the ear, twisting her head to one side, until she held still. Mhumhi let go and backed away, panting. Hlolwa watched him, blood trickling down the inside of the shell of her ear. “I didn’t come here to hurt you,” he said, when he had caught his breath again. He noticed that Bii seemed to have entirely vanished. Hlolwa said nothing. Her head was low, her lower lip showing traces of thick white foam, her tongue just protruding. Her pale eyes were dull, and her belly swung heavy with teats. But her tail was raised. Mhumhi took another step back. “You’ll need help,” he said, firmly. He had thought that she would laugh, but she did not, merely parted her jaws with a sticky sound. “I know one place where there is easy prey,” said Hlolwa, in that same whisper. Mhumhi’s chest tightened, and he turned his head to one side, composing himself. Now she laughed, a harsh whuff-whuff sound. Mhumhi looked down into the black tunnel, feeling dull horror settling within his breast. He bounded a step forward, and Hlolwa crossed in front of him. “More than three,” said Bii, his fluffy tail twitching over the black rubber. Hlolwa’s eyes thinned. Hlolwa started to growl and he hunkered low, licking her chin and twittering. Bii was laughing, but Mhumhi simply could not contain his exuberance. He whined and twittered and tried to work his way around Hlolwa towards her dark den. She snapped at him, narrowly missing his ear. Mhumhi’s waving tail slowed, and he recovered a bit of sense. He lowered his head and backed away, and the hard line of tension between Hlolwa’s shoulders eased. “You lied about when they were coming,” he pointed out. She looked up at Bii, her gaze molten, and he gave her his impish grin. “I would be under guard now, wouldn’t I,” Hlolwa said. She stepped closer to him, and he jerked, stiffening, raising his head as she licked his chin and lips. 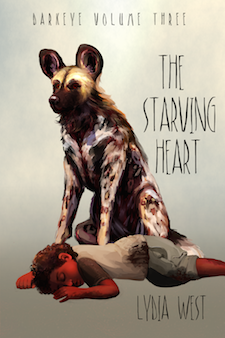 The gesture felt eerie, for she was silent as she did so, with none of the ordinary painted dog chatter, but the physical aspect was enough to make his stomach heave and deliver meat to her. She devoured it quickly, in a series of gulps, and then sniffed the ground when it was all gone. “I can bring you more,” said Mhumhi, licking his lips. He wanted to back up more, but his rear legs were against a column of tires. Hlolwa opened her mouth, probably to say something along the lines of ‘good,’ but Bii spoke first. The word seemed to strike Hlolwa, for she jerked a little. She trailed off. Her ear, notched and ripped where Mhumhi had bitten it, flicked. “At least…” said Mhumhi, and then stopped. He had nothing reassuring to say. She paused, tilted her head slightly. “I may smile when I kill you,” said Hlolwa. “You are not my benefactor, Mhumhi,” said Hlolwa, but her voice was calmer than it had been. She retreated back into the darkness of the tires. “I wish I could see them,” said Mhumhi, drooping a bit. Mhumhi was about to say that his mother had never minded them looking at her new puppies, until he recalled her unusual circumstances. “I had three small daughters,” said Bii. Mhumhi thought he would have said more, but the fox just just lay there silently after that. All the same he was wary as he traveled alone back to the fire pit. He did not think Telipa and her companions would actively seek to harm him, but. He had been though enough that he knew the value of caution. He only really noticed as he traveled back that there were very few screamers near that end of the dump, probably because there was little that looked like food in the area. He only started seeing them again when he had been traveling a good while. They stood and watched him pass, some shambling a few steps closer, hesitated when he ignored them. A screamer male with jutting ribs and a drooping belly smiled and reached for him, but Mhumhi turned his head away. He and Kutta had been out of meat, and when Bii told them about Hlolwa, they had made a swift decision. His stomach turned. It had knelt in front of them. Patted Mhumhi’s head, before Kutta sprang upwards, locked her jaws on its throat. And perhaps the really awful thing was that it had died without a sound, only giving a few kicks when Mhumhi tugged the skin on its belly away, devoured its stomach and its lungs. And then nothing but the eating. With death the screamer was mean, silent, guiltless, precious meat. It had been so easy when they both had felt justified. His own stomach constricted a little. They couldn’t even finish the whole screamer, not just the two of them, even when feeding Sekayi and Mini and Tareq. It would go bad before they stripped all the meat away. They didn’t know how to preserve it like Sekayi did. It was a horrid irony. He hoped Hlolwa would eat more than they had. Surely she would be hungrier, after what she’d been through. He reached the fire pit and came back down into the little valley. Kutta greeted him at once, whining and licking his chin. “Every one,” Mhumhi confirmed, deciding it would be tactful to omit the dead. “All for you, Tareq,” said Kutta, but her eyes flicked to Mhumhi, and he thought she might have caught his small cringe. “But they’re mine!” said Tareq, twisting his toes around in the dirt. “Then we have to be patient,” said Kutta. Tareq still looked a little frightened. “If they get sick, will they die?” he asked. “They won’t get sick if we let them be for now,” said Mhumhi. There was a creak and a rattle, and Mini pulled herself out through the concrete door. Mhumhi’s ears shot forward. She seemed to be standing up. She pulled herself further forward, her forepaws hitting the dirt. Mhumhi saw that she was strapped in to some sort of cloth and wire contraption, with her rear legs raised up so that she could pull herself forward on two shaky-looking wheels. “It doesn’t do dirt very well,” Kutta said snidely, as Mini’s wheels bumped off of the concrete. “Oh, Sekayi, it is perfect, and so are you,” whined Mini. Her spine twitched the way it did when her tail wanted to wag. “It’s only a prototype,” said Sekayi, seeming modest, but Mhumhi saw that the corners of his eyes were crinkling. “I can drag myself over to bite your ankles,” grunted Mini, pushing away with her front paws, but it seemed Kutta had been right about the contraption’s abilities on dirt. The wheels creaked and barely moved. “Good, because I wan’t planning on spending any less time there,” crooned Mini, licking his chin. Kutta tossed her head towards Mhumhi. “I should say he does,” Kutta grunted. She gave the pair a furtive glance and drew closer to Mhumhi. “She said she lost some,” Mhumhi told her, voice lowered. Kutta favored him with a steady yellow gaze. “Right,” Mhumhi echoed, squirming a little bit. He went with her and the rest of their little family back into the concrete house. Sekayi put Mini down on the ground and went to fill one of their bowls with water. Tareq sat down at the table and put his head in his arms. “What’s the matter, Tareq?” Kutta asked him, nudging up alongside him. “What if they get sick?” said Tareq, his voice muffled in his arms. “If you want those puppies, you’d better take them away early as you can,” said Mini. “Before their mother poisons their ears with her words. Best if you could get her teats to swell, let her nurse them.” She jerked her tiny muzzle towards Kutta. “What’s a teat?” asked Tareq. “Apparently you’d risk us dying for that,” grunted Mini. “Mhumhi’s right,” said Kutta. “I don’t want us to end up with dead pups.” She looked meaningfully over at Tareq. Mhumhi gave a thin sigh. He lay down on the cool concrete for a while, as the conversation turned to other things. Sekayi brought them water, then pulled Mini out of her contraption to go fiddle with it. “All right,” said Kutta, whisking her tail, and she went outside. “Do you think you can make one of those that would let her walk over the trash? Or the sand?” Mhumhi asked. Sekayi smiled wider and stroked the top of her head. “I forgot I need something else,” he said, pushing himself shakily to his feet. He hobbled out of the house. Mhumhi slowly sat back down on his haunches. “You should’ve gone,” said Mini, but there was no real bite in her voice. She was looking at the doorway, which Sekayi had vanished though, with round eyes. “I’ve never thought that was a fault,” said Mhumhi, half laughing. Mhumhi looked away a moment. Tareq’s head was still in his arms on the table, though his eyes were just peeping out at them. Mhumhi gave her a critical look. “Why would a human want a wolf puppy?” Mhumhi interrupted. “I do not,” Mhumhi said irritably. “I mean, I like puppies, but of my own-” He glanced at Tareq and hesitated. Mhumhi said nothing, and she gave a little sigh. “We all have our own opinions,” said Mhumhi. “I should be grateful I should be grateful to all of them.” punctuation after first grateful? or eliminate the repetition?